In the beginning, the study of Arabic is about coming to terms with how the language works. You start to grapple with the diglossia, with the verb system (roots everywhere!) and start working your way through one of the big textbooks that most programmes prescribe. After a few months, you want to start communicating with people, but every attempt is met with some kind of difficulty or failure. Either you’re not speaking the right dialect, or you’re not attempting to speak using dialect at all. You study a bit more, and you’re finally able to communicate with your Lebanese or Tunisian friend, but the moment you come across someone speaking a different dialect variant you’re back at square one. What’s the solution to this problem? Do students of Arabic have to learn every dialect? Thankfully, no, though you’ll want to get a basic familiarity in some of the main broad patterns that different dialect groups employ. This is where the good people at Lingualism come in, and their two-volume Arabic Voices series. (Get Volume 1 and Volume 2 from Amazon here, or order direct from Lingualism). The great thing about this book is that every monologue comes with a wide variety of exercises and supporting materials to help you get the most out of the language used. You start off with some basic comprehension questions alongside some of the key vocabulary, then you dive into some of the specifics that are unique to that particular dialect. Here’s one of the exercises where you’re supposed to draw lines connecting the English to the Egyptian and to the Fusha / ‘Modern Standard’ translations. Some of the monologues also include grammar notes at the end if something particularly interesting is worth noting. Here’s an example of that ‘focus’ material. 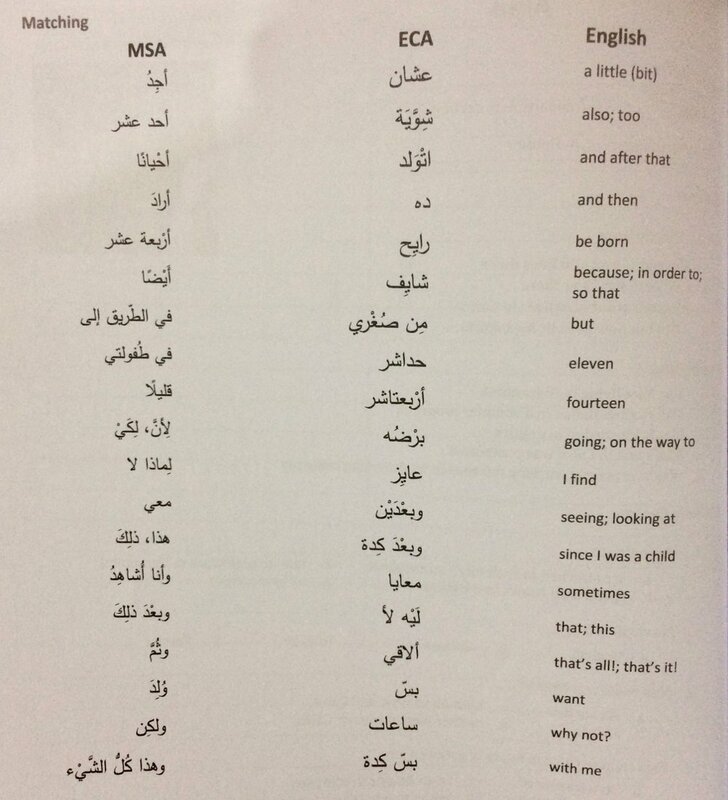 Once you’ve gone through all the exercises, listened to the video to figure out what the various new phrases might mean, you can start covering up the Arabic part of the transcript to see if you can reproduce parts of what was said on the basis of the English translation. This is hard work, but incredibly rewarding. If you want to get a full overview for how the language that Arabs speak day-to-day, these two books are the resource for you. What’s more, the monologues are short enough that you can probably blaze through the content of both books in two to four months. I don’t know of any other one-stop-shop where you can gain familiarity with the linguistic variety of the Arab-speaking world, plus learn a thing or two about people’s lives and culture(s).